If you let your acrylics cure then seal with a clear coat you can put the enamels over them with no problems. Just don't put them directly on the acrylics with out something in between. A clear coat of what? Future? Thats acrylic and, in my limited experience may do the same thing. "Well ... let's play this out logically then ..."
You can put acrylic over enamels, but enamel over acrylic is generally frowned upon. But ... as always, it depends. I've had zero problems painting MM Enamel over Tamiya and vice versa. 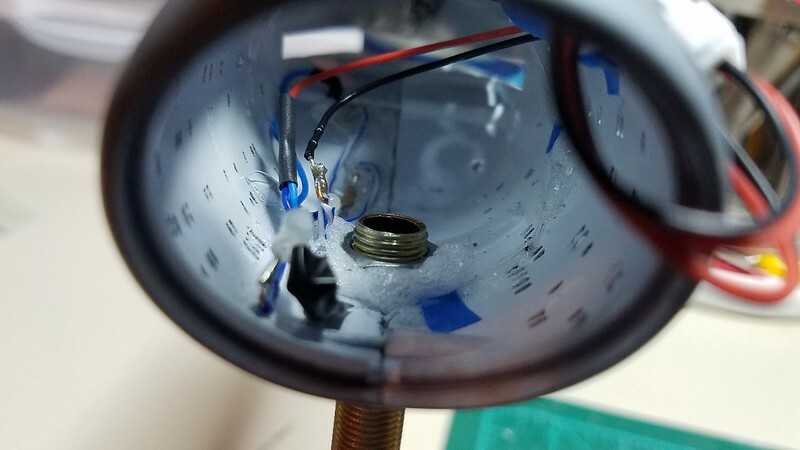 Tamiya contains Isopropanol (rubbing alcohol) and glycol ethers. MM Acryl also has glycol ethers in it too, so it isn't purely water based and I would assume the behavior would be similar. As Tankton said, let things fully cure, even if it is days ... and test your layers on some scrap if you're really invested in a particular color. And, spray in light coats. Can't really stress that enough! with those going over cured Future, but, I'd test it. "It pays to keep an open mind, but not so open your brains fall out." I use Krylon matte finish or if I want a gloss I will use Testors decal bonder. Never had a problem with those. I won't use Rustoleum because I use Model Masters Enamels and they don't play well with Rustoleum. Doing your base coat in enamel is fine for acrylic paints to be put on top of it. That color is also available in acrylic if you want. The dark ghost gray is available in acrylic. However if your base coat is enamel, you won't gave a problem putting enamel on enamel. Thanks for the reply, Steve. I agree with the cartoonish look of some of the suggested colors. There are a number of builds out there of people who I really respect but don't like the color pallet choices they use for the E-C. The more divergent the color tones are on these large ships, the more out of scale the resulting build looks. 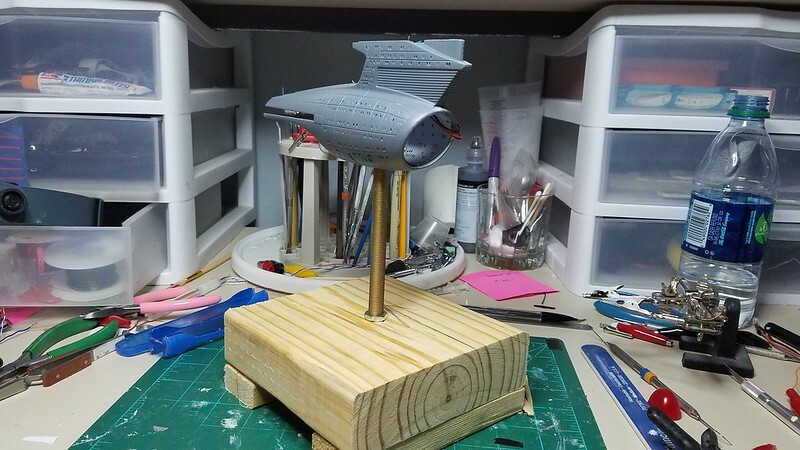 I've been using the Acrylic Model Air paints from Vallejo with great results. They take the pain away from airbrushing for me and are super easy to clean up. I'll look up those colors you gave and see what the Vallejo equivalents are and see how they look. I'm looking forward to following your build. Thanks!! Thanks, Ladies and Gents, for the sound advice on the windows and the painting! Sometimes, most times in fact, I feel like I am still very new to this hobby and still have so much to learn. I'm gonna go with what I have just making sure everything is well-cured before I proceed! I am trying not to post too much and depite the length of time between posts and the work I have been doing, I feel like the forward progress is marginal at best. But, pressing on! I finally felt like I could seal the saucer up. So I to a hypodemic needle, filled it with Tamiya extra fine cement and sqeezed it into the seam. I then went wild with the clothes pens (clothes pegs for our UK friends!) and clamps trying to get as good a seal as possible. CA or expoxy to get it to seat and seal properly. about hooking up the TenaControl board as I smoked the last one. I have the replacement (Thanks, Ralph!!) and I don't want over do it. But I should before I seal it up and then something doesn't work! 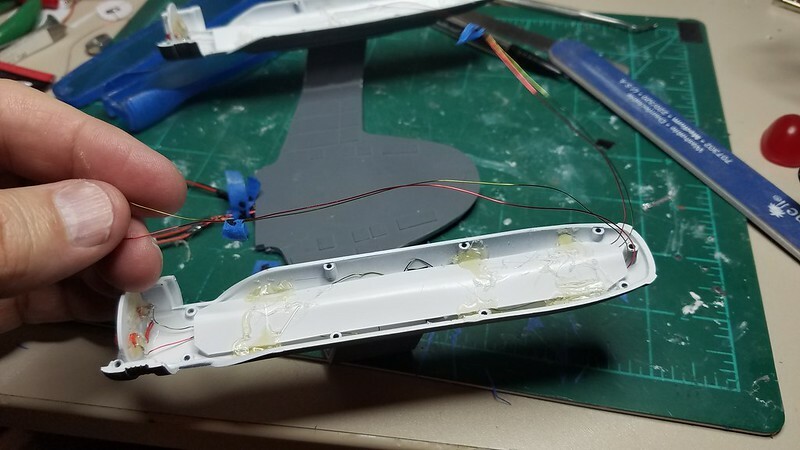 Here is a shot of the Nacelles being attached.YES, I did pull out my levels to check that everything was copacetic with the placement. 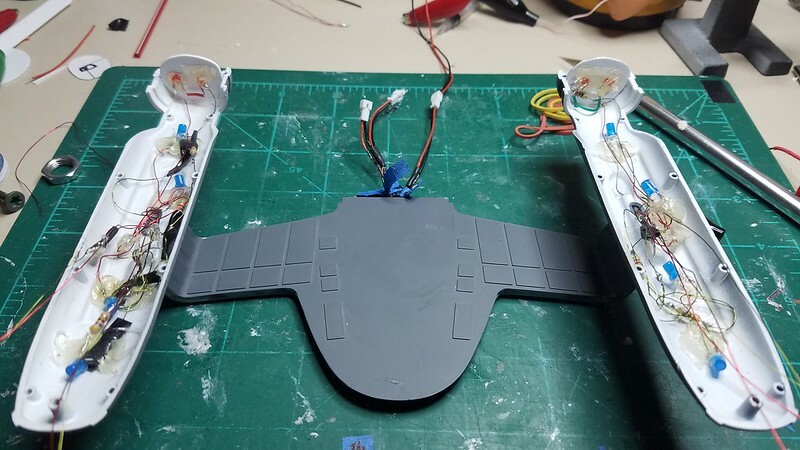 From there I hope to build the display stand, the rest of the nacelles and being painting the saucer. Closing up that saucer is a big deal, Steve! Nice to see things are moving along well. The close pegs look awesome mate, but it might have been better to use a batch of giant green hands. (Yeah... not sure where that came from). Anyway, looking really cool. That will be done before you know it. Looking good. I applaud your gray choices as those are readily obtainable and subtly different from each other. Always looking forward to another update on your work! BTW, what are your lighting plans? I noticed three pairs from each nacelle and several from the saucer. Nav lights and such in addition to bussards/chillers/deck lighting? Thanks, Al! Yeah, it is! Another "finally"! At least, I hope it is! ...but it might have been better to use a batch of giant green hands. (Yeah... not sure where that came from). You're not...sure....?!?!? DUDE! How could you not be sure?! I'm sorry. You have lost geek/nerd points. Thanks, Scott! I appreciate your kind words! Yep, good eye! 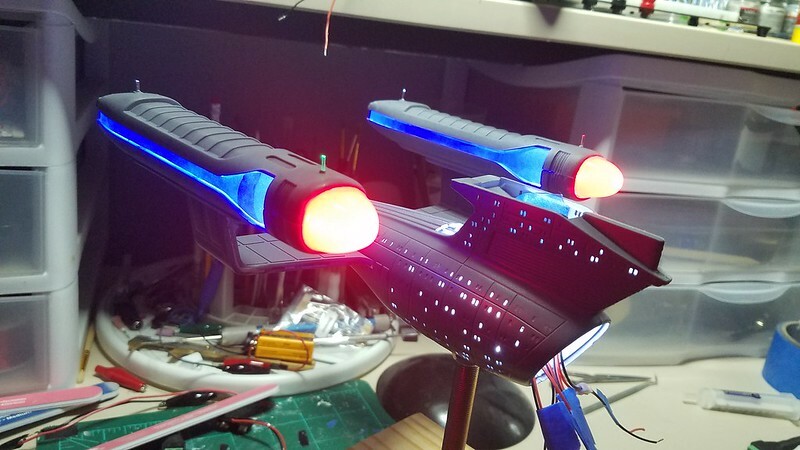 While I was at and IPMS Regional show in San Antonio, I met Ralph from TenaControls and he sold me a board that included Federation style strobes and Nav blinkies. And, as you may know, I'm not shooting for on screen accuracy - more of a fantasized version of the ship. So, yeah, you got it! 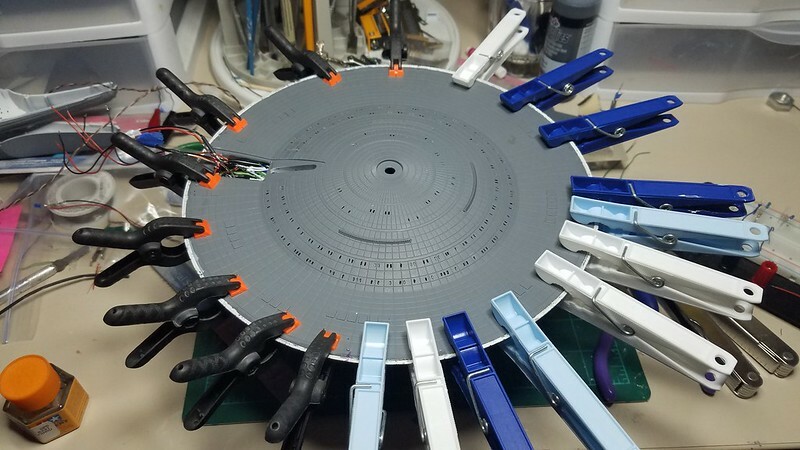 The three leads (six wires) coming from the saucer and the nacelles are 1) for the "steady on" LEDs 2) the strobe LEDs and 3) the Nav LEDs. Once I get the display stand built, I'm gonna place the board in the stand and hopefully wire it all up correctly. Thanks, guys, for the support! Stay tuned for more exciting updates! Thank you for correcting my improper etiquette on the green hands issue. Hahaha. It's funny, but I don't know any of the episode names, except maybe 5 or 6 of them. All the rest, I have no clue. I pretty much know every line in each show too, but not the names. I'm the same with the James Bond movies. I've seen all of them tons of times, but have no idea what the names are. Maybe I need one of the those brain machines like Bones used on that one episode when they stole Spocks brain. "We're made of star stuff"
"Once I get the display stand built, I'm gonna place the board in the stand and hopefully wire it all up correctly. " Just don't forget the resistors!!! since I had a long weekend just past - I do! Hurray! don't have the Blu-rey set is because I haven't found it yet! Thanks, Quarky! Just don't look too close! I KNOW, RIGHT?! Luckily, I didn't forget - this time! 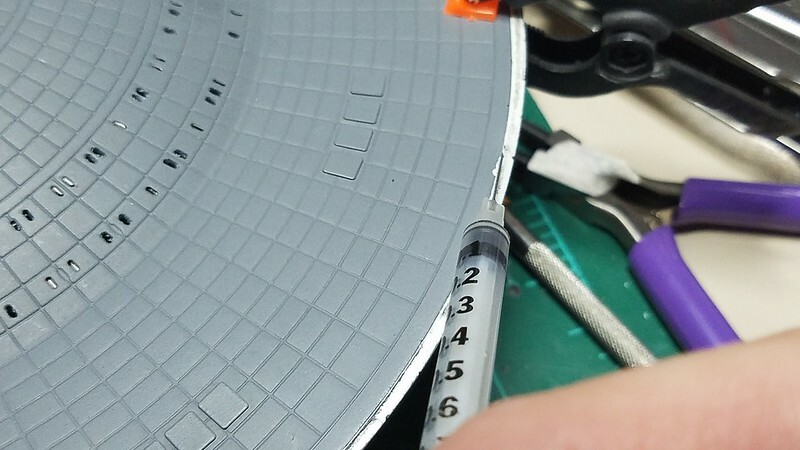 I tried to close up the saucer, as you saw, but the adhesive didn't bond through the paint and primer and when I went to pick it up it popped the entire seam out! my display stand holder, thingy. 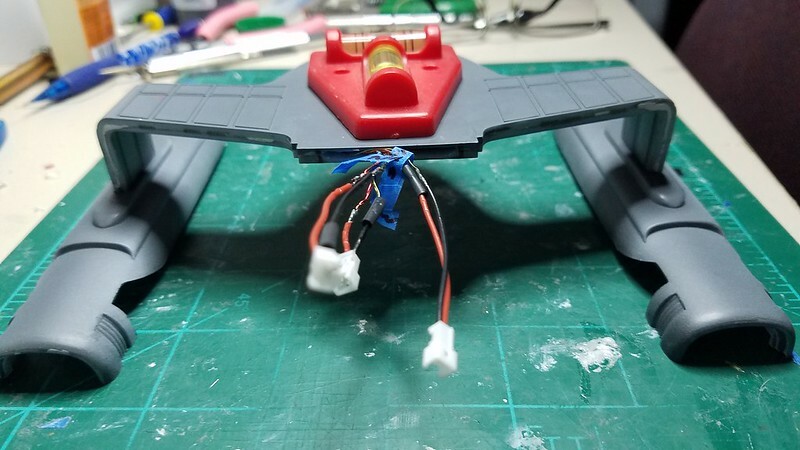 The pic shows it with the nacelle supports in place. I did this to try and prevent warping the two halves while gluing them. to glue the nut securely in place. I did this so I can mount it later on a temp mount, built it to a point and then take it apart and mount it on the real display stand. 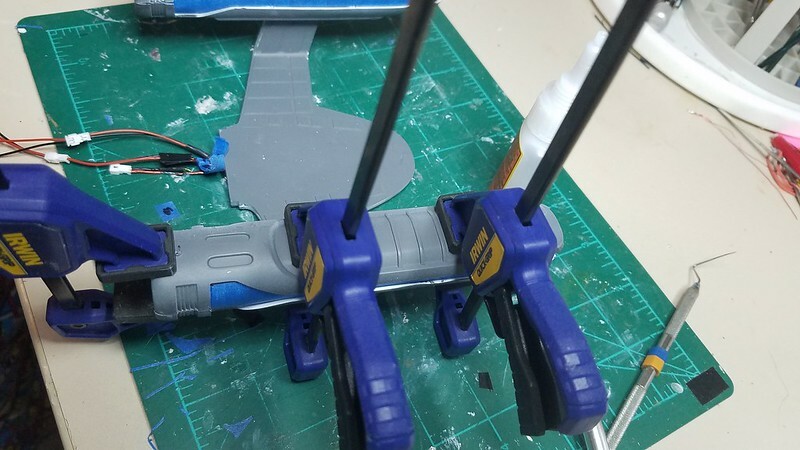 Then I started on the nacelles themselves. I built the LEDs (remember I have about 1400 of the little beggers I got for Christmas; another reason I didn't use SMD strips!) and placed them in the lower half. I also built a divide for the Bussard Collector Red LEDs to prevent as much light leak as possible. Both of these are the "Steady on" lights, so they are hooked to the same circuit as the main ships lights. 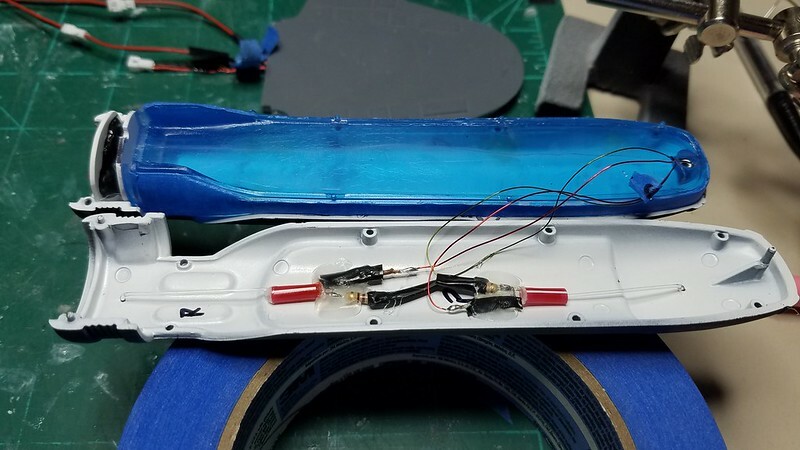 Then I placed some 0.10mm styrene to further diffuse the blue lights and threaded the upper half Nav and Strobe light wires through the blue DLM parts. 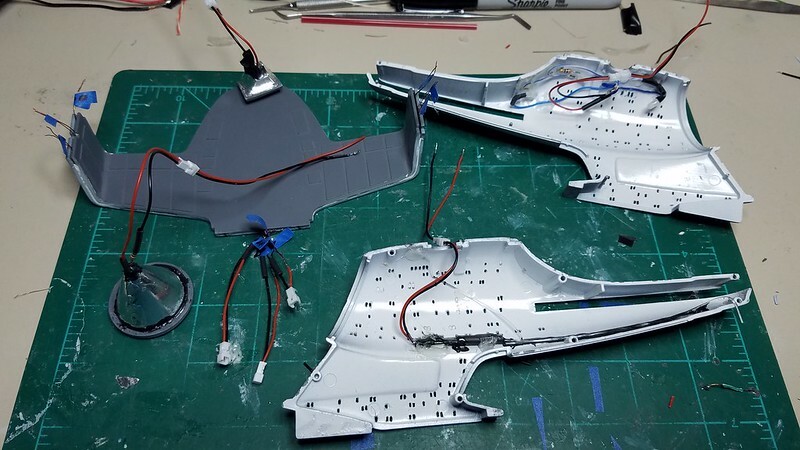 I then pre-masked the DLM parts so I wouldn't have to worry about it later. 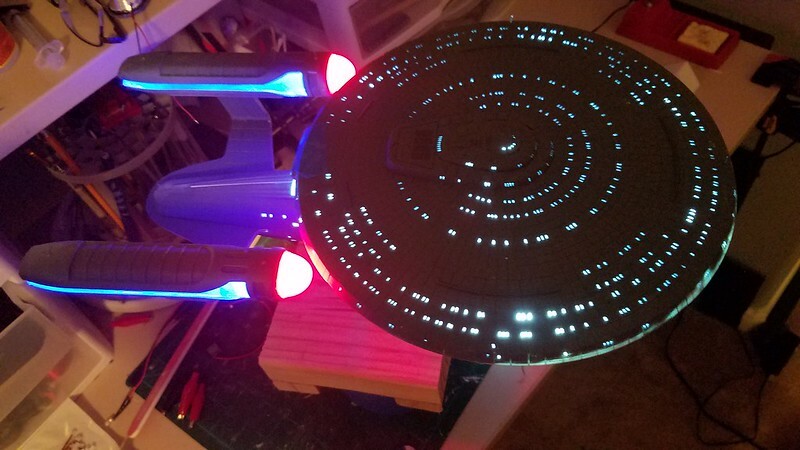 I spent some time making the LEDs and the Fiber Optics (FO) for the upper half of the nacelle. I did a variation on a theme from scottminium. 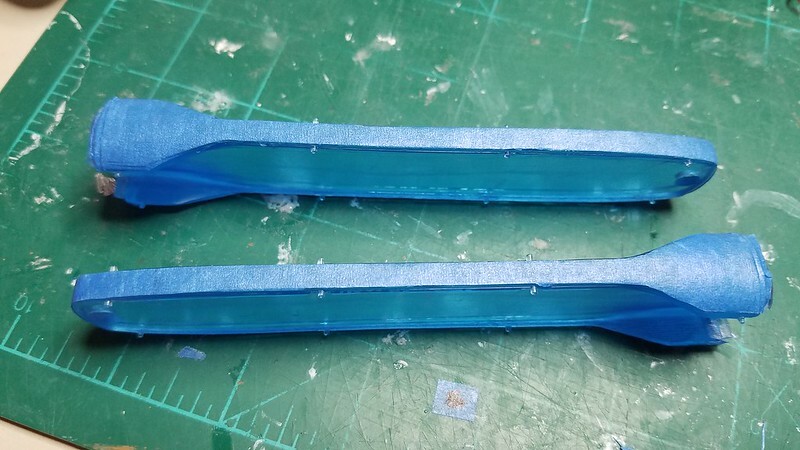 The coffee stirrers fit very snugly over the 3mm LEDs. So I slid them on, then formed the FO to the length and shape I needed and placed the end of the FO in the coffee stick and used some white gorilla glue to hold it all in place. Et voila! It seems to work! 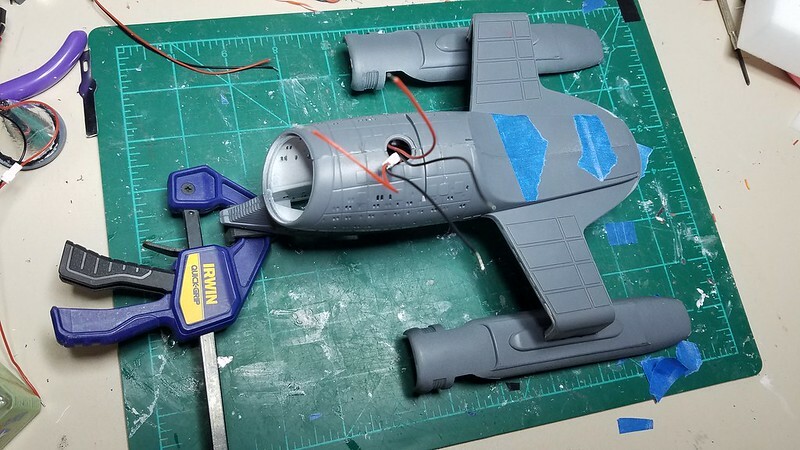 I covered the whole thing with tulip paint and glued the nacelles together. 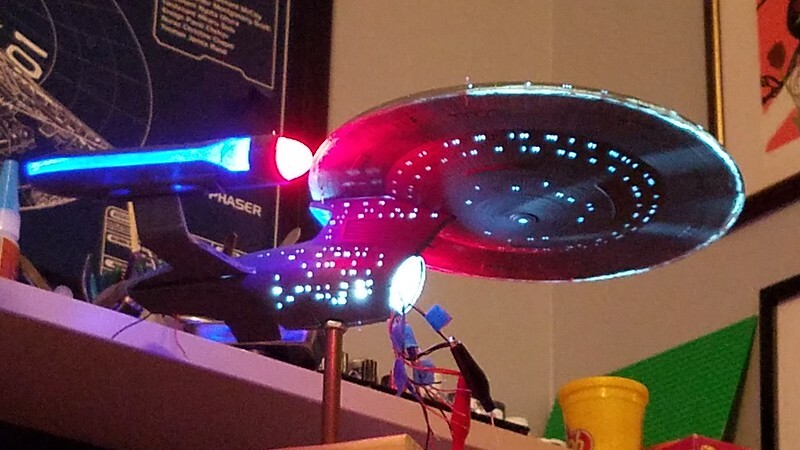 A light test later and I seated the Red DLM bussard collectors and I had glowing Nacelles! Hurray! I built a temporary display stand (maybe "Work stand" would be a better term!) and mounted the SH on it. Then I slid the nacelle support into the SH and, sorry guys, I took some beauty shots! Well, it went down hill from there. I propped the PH up on a Round 2 display stand I had and hooked it all together. 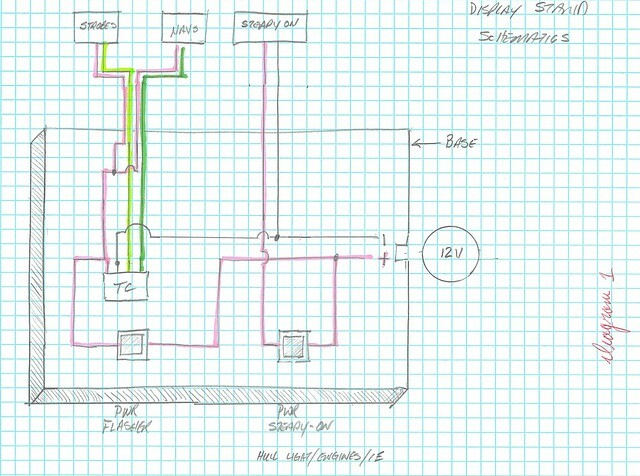 The I just threaded the PH wires through the SH and hooked it all up! Well, that's all for now! I now have some sanding and finishing to do and then on to the painting. Thanks for following along with me! Any tips, comments, or suggestions for improvement will be greatly appreciated.